It was always an ambition of mine to climb Mt Kilimanjaro especially after seeing it at first glance at a young age while living in Tanzania. 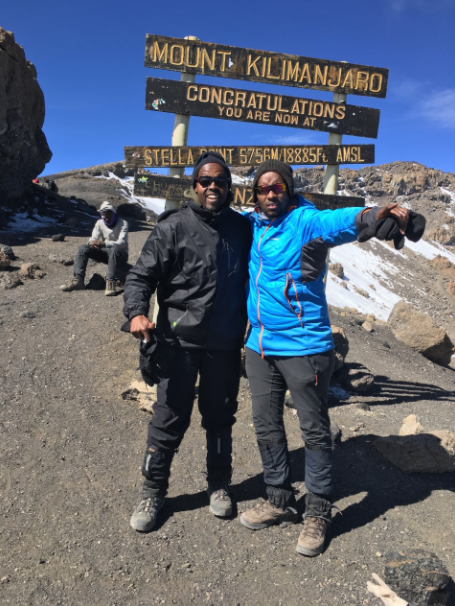 On December 27th 2017 – January 2nd 2018, along with my brother Nyaika, we decided to climb the mountain and raise funds for Universal Chance. 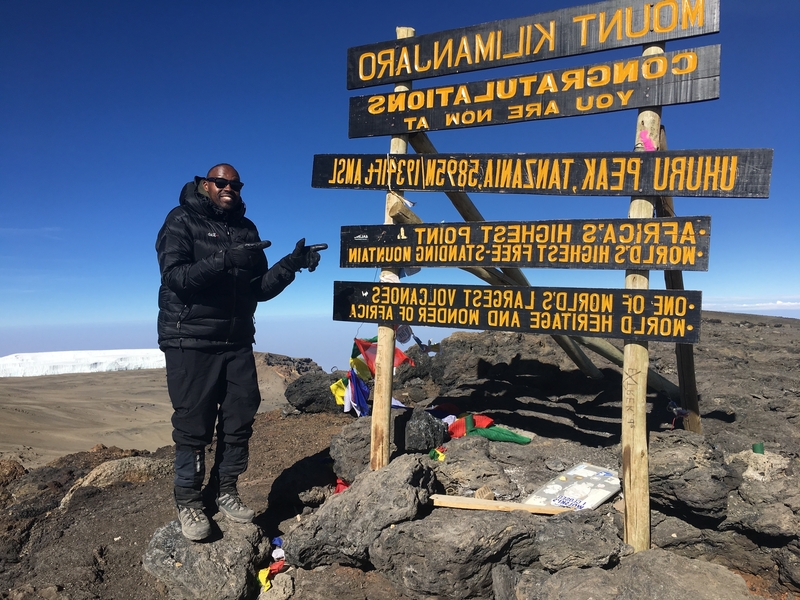 Knowing that it stands as the tallest mountain on the African continent and the highest free-standing mountain in the world meant that some physical preparation was needed for the 7 day hike. I went for regular morning runs with weights in a rucksack – which I was told was the best form of preparation for Mt Kilimanjaro from a Nepalese hiker that I met 3 months before my adventure. The group of 30 hikers which consisted of both male and female from ages 19-67 all had the same vision, but the journey getting there was certainly not what we could prepare for. I was surprised by the slow pace of walking at which we started. A tactic encouraged throughout. Thick dense forest, humidity and light rain were the conditions that we were walking in on that first day during our slight ascent. We took a route called the Machame Route, a route that begins just east of the renowned Serengeti National Park, a popular route of choice for many people because it provides impressive views and a variety of habitat. The prospect of seeing the 5 different climate zones during the hike (Lowlands, Rainforest, Moorland, Alpine and Arctic) was also an attraction, since it allowed me to take my mind off the task at hand. It was only after 24 hours that we could see the target, the end goal and even after being at that height (5000ft), the symptoms of altitude sickness and fatigue were none existent. The 30 of us, as well as 50 other porters (who carried the heavier equipment – tents, food supplies, first aid kits) were engaging with one another and sharing life stories. What I quickly realized is that it is a gradual ascent and there is not much time to acclimatize. Each day we walked for 8-10 hours and at the end of the day, we arrived at a camp site readily prepared for us by the porters, the Knights of the Mountain. It was only on day 3 that the landscape changed drastically. There was less vegetation, no wildlife, and the temperature changed. We were at 10,000 ft and just over halfway to the mountain peak. The dizziness, headaches, ears continuously popping and vomiting had arrived! I was fortunate and only experienced slight dizziness and headaches which were curable, but the less fortunate (2 hikers) needed to leave and were encouraged to stop their journey and were assisted back down. We all began to look after each other more – we shared food supplies, snacks, offered assistance whilst rappelling, shared clothing and prepared ourselves for the unexpected! An early and lengthy rest was encouraged at night on Day 3, because Day 4 began with a climb up Barranco Wall, a rocky hill that is only 800 feet in elevation, but energy sapping scrambling up the mountain is the only way to reach the top. This was one of my biggest challenges throughout the climb especially because it began to rain heavily. Having reached the top of this wall (which took us 2 hours), we all had a huge sense of accomplishment, in addition snow and ice were now visible. The final day of ascending began with a 7:00pm bedtime and a 11:30pm wake up the evening prior our summit. We made sure to make time to cheers and wish each other a quick Happy New Year. The intention here was to time our summit and witness the sunrise into January 1st, 2018. I remember wearing as many layers as possible for this summit which proved to be a bad decision because shortly into the ascent, I began to sweat and tire very quickly. One of the porters stopped me and asked me to sit down while he examined my clothing and water which had now frozen and I was unable to slurp anything through the straw. I was encouraged to take my water pack out of my rucksack and place it under my clothing, between my chest and stomach to provide warmth. The porter then asked me to remove my balaclava and took off one the jackets that I was wearing – I was clearly overheating and wasn’t adjusting well to the climate conditions. Not long after this, I found my stride and felt a lot more comfortable to continue. I vividly remember the guide telling me that we were 15 minutes to the top (knowing full well that his 15minutes was actually approximately 45 minutes a tactic that was regularly used to encourage us!) but that certainly spurred me on. Reaching the snowcapped Uhuru Peak with Nyaika was certainly an emotional experience. We were walking on uneven volcanic terrain and dust, glaciers were surrounding us and we had blue skies above! The only sight that reminded me of reality was seeing a passenger plane flying (in what seemed to be) too close to us overhead. Looking down, Tanzania and northern Kenya were visible, and we could also see another mountain, Mount Meru clearly. I found the descent the most difficult part of the hike since we were continuously walking down hill on loose rock while it was snowing! One tactic that I stumbled across, literally was to slide down the dusty rock using my heels – it worked at an effective way to make more ground because each step was sinking and therefore taking more time to progress. From 19,000ft at Uhuru peak, it was advised for us to be below 10,000ft to prevent any altitude sickness symptoms, so our decent was very quick. In the meantime, I did see several casualties, paramedics with metal stretchers attending to people who were less fortunate that those of us who had made it to the top. It was then when I realized the full extent of our journey and achievement. In total it was 7 days, 75 miles, 150,000 steps and a 19,000 ft climb! Ultimately a fantastic experience and I was fortunate to be with a great group of people to share it with especially my bro!